The Elite-9 Ti2 units are some of the new fish finder and chartplotter combos released by Lowrance in 2019. They are available in different bundles, with various charts and transducers. In this post, we’re going to address the Lowrance Elite-9 Ti2 part number 000-14652-001; this unit comes with the Active 2-in-1 transducer, the Mid/High CHIRP Skimmer and the basic US Inland charts. The Lowrance Elite-9 Ti2 is Active Imaging 3-in-1 ready, which means it supports 2D CHIRP sonar, DownScan, and SideScan sonar. It supports five main frequencies, these being 50/83/200/455/800 kHz. It is also compatible with all the new Active Imaging transducers. As we’ve mentioned above, this is the Lowrance part number 000-14652-001 which includes the Active Imaging 2-in-1 transducer for SideScan and DownScan, and the Mid/High CHIRP Skimmer for traditional sonar. Both these transducers have approx. 25′ (~8m) of cable, a transom mount, and an internal temperature probe. The Active Imaging 2-in-1 transducer has a 9-pin connector, while the 2D transducer has a 7-pin connector. For traditional sonar, the 2D skimmer uses two conical beams. Their coverage is 22° @ 200 kHz and 52° @ 83 kHz. The CHIRP modulation intervals are not specified. This transducer offers a depth capability of 1,000′ (305 m) when using the mid-range CHIRP beam (83 kHz). For SideScan and DownScan, the Active Imaging 2-in-1 transducer uses oval-shaped, thin beams. Their exact degree coverage is not specified. The side coverage of the SideScan beams is 300′ (91 m) @ 455 kHz (on each side), and 150′ (46 m) @ 800 kHz (on each side). The specified depth capability for the DownScan beam is 300′ (91 m). This Lowrance fish finder makes available a wide array of sonar applications. The most notable one is FishReveal™. 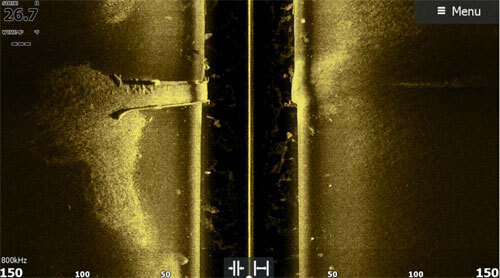 This feature puts all the fish arches detected by the 2D CHIRP sonar beams into the DownScan Imaging view. Therefore, it gives you the possibility to make better assessments with regards to the position of fish targets in relation to the better-detailed structure, vegetation, or the bottom. The Lowrance Elite-9 Ti2 000-14652-001 is equipped with a 10 Hz internal GPS. This means it can provide position updates 10 times per second. It supports WAAS/EGNOS/MSAS for position augmentation and also has a GPS speed function. The unit can store up to 3,000 waypoints in its internal memory, offering various icons so that you can personalize each WP that you save. It also has route creation and trackplotting functions. It gives you the possibility to create and save up to 100 routes, and record up to 100 tracks. Each track can have up to 10,000 plot points; also, each track can be converted into a route so that you can add waypoints to it and re-trace it if you want. The unit’s internal chart platform is the U.S. Inland Basemap. These charts cover more than 4,000 U.S. lakes with 1′ contours. 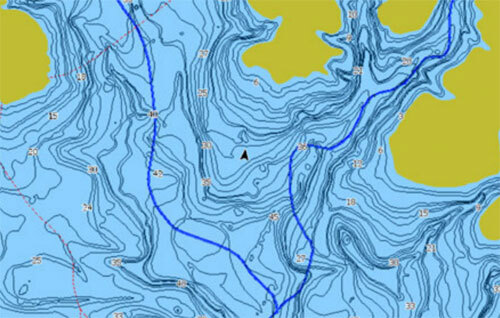 They’re based on the official C-MAP charts and offer basic support for navigation also making it easier to narrow your search for productive water and to locate fishing hot spots like ledges, drop-offs, and cover. Of course, the unit is also compatible with various other charts, including Navionics Gold, Navionics+, Navionics Platinum+, C-MAP Max-N, C-MAP Max-N+, Insight Pro, and Insight HD. One of the new features available with all the Elite Ti2 units is the Genesis Live. This feature can be compared to the AutoChart Live offered by the Humminbird units, or the SonarChart Live from Navionics. It’s a depth contour recording feature that uses the 2D sonar and GPS data. It allows you to reveal and draw the depth contours of your favorite lake and create personalized charts with 1/2′ contours. Thus, if the unit’s current charts do not offer satisfying detail for your lake, the Genesis Live feature has you covered. The unit also has the StructureMap feature. This gives you the possibility to overlay the unit’s current maps with images recorded from the SideScan sonar. Therefore, you can visualize the underwater environment in relation to your position which can help in interpreting the SideScan images better. Also, when Live Data is selected, the SideScan imaging history is displayed as a trail behind the vessel icon. The length of this trail varies depending on available memory in the unit and range settings. As the memory fills up, the oldest data is automatically deleted as new data is added. SmartSteer is also a feature supported by this unit. This feature offers autopilot and other functions for MotorGuide Xi5/Xi3 trolling motors; however, this requires MotorGuide PinPoint Gateway. It provides control for Power-Pole anchors. It can also show data from an AIS unit but does not support Radar. The Lowrance Elite-9 Ti2 features a 9-inch display with a pixel resolution of 800H x 480V. It’s a SolarMax type display with integrated touchscreen technology. This means it responds to all touch commands as a tablet or smartphone. However, it also has five buttons on the right side for various functions, such as zoom, page swap, and the power button. The unit has integrated LED backlight for superior readability even in direct sunlight or from sharp angles up to 85°. It is IPX7 waterproof as well, which means it can withstand incidental water exposure. The included mount for the unit is the classic Gimbal Bracket with side knobs. A unit cover is included, as well as a 7-pin transducer to 9-pin sonar adapter cable. The Elite-9 Ti2 supports both Ethernet and NMEA networking. It has an NMEA 2000 Micro-C port, however, it does not have IP camera ports such as the Raymarine es98, for example. It also does not support Radar. Wireless connectivity is available with this Lowrance unit as well. This being said, you can connect the unit to a Wi-Fi hotspot in order to access the GoFree Cloud base to download maps, software updates, or share and backup your recorded data. Finally, the unit is equipped with a microSD card slot. Therefore, you can save and share data via microSD card or use various charts available on microSD format. In-dash mounting kit is not included. 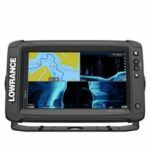 The Lowrance Elite-9 Ti2 Active Imaging 2-in-1 US Inland Basemap is a fish finder and chartplotter that offers CHIRP sonar, DownScan, SideScan, 10 Hz GPS, base charts, Genesis Live, Wi-Fi and Bluetooth, superior networking capabilities, and a wide array of other features. It includes two transducers, the Active Imaging 2-in-1 for DownScan and SideScan, and the Mid/High CHIRP Skimmer for traditional 2D sonar. Although it includes charts for the US inland charts, it can also be used off-shore if you opt for other premium charts. It’s a versatile fishing and navigation tool, offering excellent value for the price.